If you have any questions or want to enquire about dates, use our form to contact Valeria Carfora or see their website for more information. The last class was taught here in the 1960s and the Carforas’ sensitive renovation of Lusiana’s old school resonates with good energy and character – music from the ’40s plays gently in the background. A series of hairpin bends leads to the village some 800m up, south of the Asiago Plateau, between Marostica and Asiago and a great area for walking, biking and mushroom hunting! Superb views are of soaring mountain tops, the ancient bell tower and the valley below. Historians will know that Edward Brittain died here in 1915; Vera Brittain’s ashes were scattered on his grave. A stove burns in the lofty Sala dell’Alfabeto where a feast of a breakfast is served at two long tables. When it’s warm you can be out under lime trees, among pots of flowers in the former playground. Bedrooms are a pleasing mix of old and up-cycled: wooden and cement-tiled floors, quirky chests, desks, and wardrobes, colourful rugs, paintings and maps – and new: well-dressed iron bedsteads, double-glazing, designer lamps. Modern shower rooms are elegantly white-tiled with fun mirrors (in the top room there’s a clawfoot tub). It’s lovely here. Minimum stay 2 nights in high season. Pets by arrangement. Singles €60-€80. Extra bed/sofabed available €5-€20 per person per night. 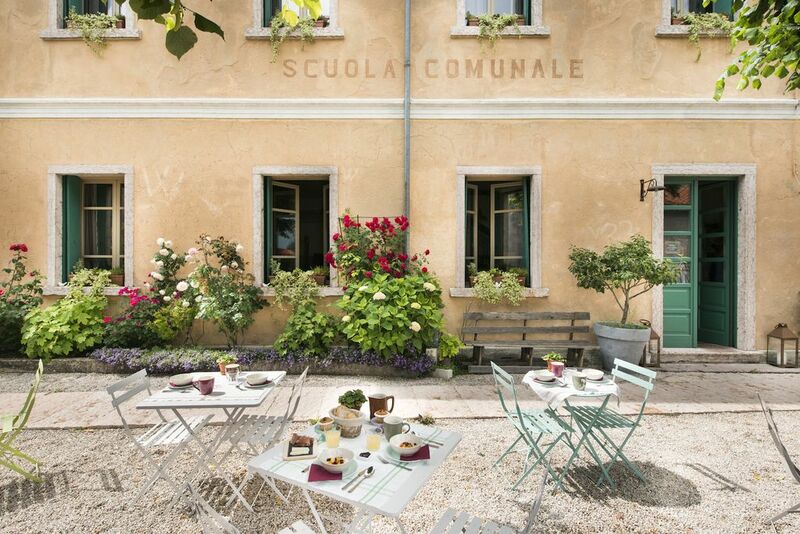 Have you visited Locanda La Scuola? Be the first to leave a review. Asiago is a beautiful mountain village: pastures, walks, alpine huts, cheese, restaurants and shopping. The Museo Diffuso in Lusiana: Alpine botanical gardens, la Valle dei Mulini, The Sojo Art & Nature park, the ethnographic museum, the prehistoric village. Beautiful trips by car, motorcycle or bicycle: La Strada dei Vini, la Strada dei Ciliegi, try wine Valpolicella & Prosecco wines, a trip through the Alpine huts. Take a walk in the woods, in the contradas, look for mushrooms, go mountain biking. Hiking, Nordic walking, snowshoe walking, skiing, paragliding, rafting, climbing, cycling, mountain biking, gold, horse riding and motorcycling.